You can hold, blind transfer, or disconnect the callback interaction. (If you disconnect the callback interaction, then the callback interaction goes back in queue.) 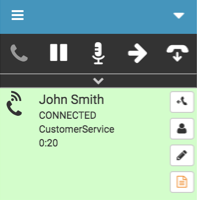 After you make the call, full call controls are available as with any call. Tip: If you use PureCloud alongside the client, then change your settings so that alerting interactions do not ring in both applications. For more information, see Ringing issues for alerting interactions. 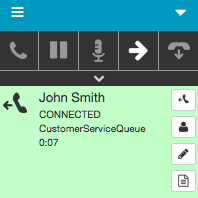 For callbacks that use scripts, open the script by clicking Script on the interaction. When the script is open or accessible, the Script icon changes from black to orange (except in Internet Explorer). Click Script to bring the open script window to the front of other browser windows. Note: The information that you see on interactions can differ slightly depending on the type of interaction. Also, your administrator can reorder or remove this information, or add different information to display on your interactions.